Pammy Blogs Beauty: Essence: Denim Wanted Collection (review) and EOTD! Essence: Denim Wanted Collection (review) and EOTD! Here I am with another *total rave* essence review! This review is for the Essence "Denim Wanted" shadow duo, glitter eyeliner, and lipgloss. Seriously, essence is one of the best low-priced cosmetics lines out there! All of these items cost me just less than $5.00 *total*! :) I found these on special display at my Ulta. There was also a denim cuff bracelet and a few polishes on the same display that I did not purchase. I also apologize in advance for the lack of skill in my photography! I have been wanting to try to do EOTD (Eye of the Day) and other makeup photos, but my self-photography skills need some improvement! lol! I am attempting to show you some looks below with the "photo booth" on my computer, but the makeup does not show up really well. But, you might get the idea! What an adorable little eye shadow duo! This is actually what drew me in to the whole collection! The duo is packaged in a Stila-like cardboard compact with magnet closure. The shadows are soft (but not chalky) and quite pigmented. Very "buttery" feeling shadows. Love them!!! They applied and blended extremely well and looked great paired together. The sliver color is just gorgeous applied all over the lid. It appears as a soft whitish silver. Nice shimmer! The blue, while it looks navy in the pan, actually looks more "purple" once applied. So, a purplish blue, if you will. Beautiful!!! I applied this navy to the "outer V" as well as the outer upper and lower lash line. 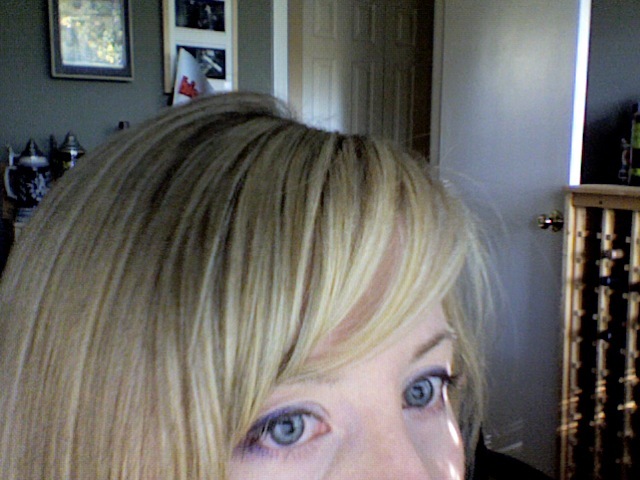 Interesting side note: The color of my eyes can be somewhat chameleon-like. My eyes are baby-blue, but depending on what I wear and what shadow colors I use, they can look either baby blue, steel gray, or greenish blue. This blue/purple color really brought out the green in my eyes. Cool! I "finished" off this look with Wet n Wild's Creme Brulee eye shadow single (my latest fav: a matte cream color that is just slightly darker than my skin tone): used on my brow bone and to blend corners of the blue color and inner tear duct corners. What a great deal for $2.00!!! This navy liner applied more like a true navy (unlike the shadow that looks purplish when applied). Formula is slightly "drier" in consistency than my other essence pencil liners. This might be because it is a "glitter" liner. The glitter is slightly "chunky" (not micro fine) and silver. You can see the glitter in the pencil and the glitter also shows up upon application, but is quite subtle. Pencil tugged a bit on the eyes and required some smudging. An "okay" liner. Not my fav, but will continue to use paired with these shadows. To intensify color and increase the wear of the eyeliner, I topped the liner with more of the dark blue/purple shadow from the Denim Wanted shadow duo. This little squeeze tube lipgloss keychain is adorable!!! And, WOW, it has turned out to be my fav product of this mini Denim Collection! I am soooo picky about lipgloss scents! This one is wonderful! It is a very subtle vanilla scent. Yummy!!! The gloss is quite thick and moisturizing. It wears very well. This is a clear gloss with whitish silver/irradecent shimmer. Just makes your lips look slightly paler and shimmery. Really love this gloss!!! And, it was only about $1.50! Can't beat that!!! Overall, a *total rave* for this essence denim collection!!! I got this on a "whim"...and do not regret this purchase one bit! I know that I will recreate this eye-look many times! It is just such a quick, easy, and flattering eye. The lipgloss is going on my key chain, so I know it will get constant use! What great quality and "fun" items for a very low price! Love, love, love essence!!! the liner looks nice. i like navy liners.